click: Host a resource or piece of hardware from your grip on The Supplier. "I can get you anything, and guarantee the best prices in town." Just as Mr. Li improves the draw action, The Supplier improves the install action. More notably, he lets you host costly cards on him, lessening the burden on your grip. The lesser cards you hold, the more you can draw up on cards you need now. Only works on resource and hardware, preferably 2-4. Once per turn, delayed install. You don't actually gain 2. Just remember never to host Political Operative on him. You won't spare a click to install the card since you paid a click to host it anyway. When played it gets you at -4 (3 credits + a click). When The Supplier is trashed, you lose X clicks, X being the number of cards hosted when trashed. So make sure you won't get tagged. 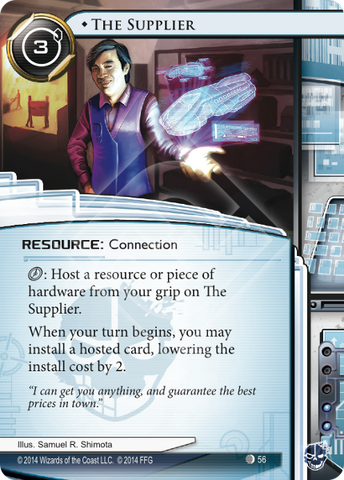 The other review is great at showing you the basic economics of the card in that the Supplier only shines in decks with a large number of resources and / or number of hardware. A big note is that you MAY install one of the hosted cards at the beginning of your turn but you don't have to. Sometimes, you don't have the money or don't want to spend it to bring out your resource but you want it out of your hand. Maybe you have two Liberated Accounts and you install one but want to get the other out of your hand but don't want to pay for it yet. The Supplier has you covered. For a couple decks that use it effectively: Qimpossible and London Calling.